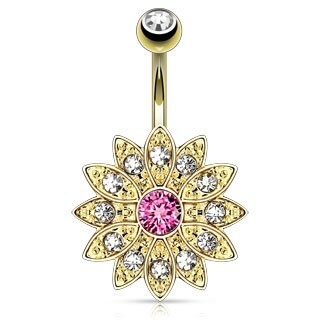 This belly button piercing is made of 316L surgical steel and is fully gold plated with 14KT gold. The top ball carries a small clear crystal. The lower ball consists of a flat gold plated flower. The leafs carries different sorts of crystals. The finishing touch comes from the bigger pink crystal in the middle.